The best of patient fall monitors just got better! Now available with an optional Wireless Nurse Call System, the Posey Sitter II offers caregivers even more monitoring flexibility with one simple-to-use, non-invasive unit. Designed for use with any of Posey's bed or chair sensor options, the Sitter II allows caregivers to select the appropriate sensor for each application. Ten alarm tones and a recordable voice option help calm the patient and differentiate between other facility alarms. An adjustable delay accommodates restless sleepers and helps reduce false alarms. The "HOLD" feature allows the patient to be removed from the sensor for up to six hours without re-programming. Indicator lights are visible from all angles and allow at-a-glance verification of alarm status, day or night. The standard nurse call interface provides dual staff notification, and allows the in-room alarm to be silenced to allow a roommate's undisturbed sleep. Ten alarm tones. There are ten different alarm tone options which can be used in different patient rooms, or to discern between different caregivers or levels of fall risk for easy patient identification. Four alarm modes Four alarm modes allow for facility or alarm choices regarding caregiver notification in the event the alarm is triggered. The alarm modes are: “Voice and Tone”, “Tone Only”, “Voice Only”, and “Mute”. Five alarm volumes. Five alarm volume settings allow for facility or alarm choices regarding caregiver notification in the event the alarm is triggered. The volume options are 2, 4, 6, 8, 10. Voice feature. 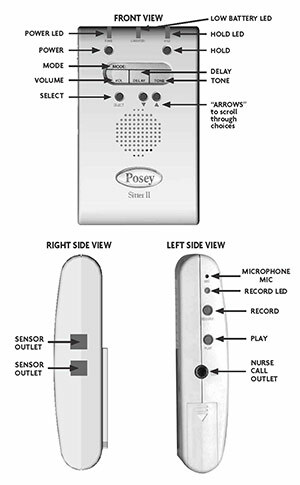 Allows a family member, friend or caregiver to record a personal message that will sound if pressure is removed from the sensor pad, chair belt sensor is unfastened or PIR sensor is activated and the alarm mode is set to “Voice” or “Voice and Tone”. This feature can provide patient communication in their language, or by a caregiver or family member for familiarity. HOLD Button. Allows you to remove a patient from a bed or chair without the need to turn off the alarm (e.g., for therapy, toileting or socializing). Alarm will resume monitoring when patient returns to the bed or chair. Optional alarm delay between 0-10 seconds. Allows you to adjust alarm timing for each patient. The delay allows you to determine, by alarm, the number of seconds between the time pressure is removed from the sensor, chair belt sensor is unfastened, or PIR sensor is activated and the time the alarm activates. Sensor monitoring. This alarm connects to any Posey sensor pad, including chair, toilet, above and below bed mattress and chair belt sensor and PIR sensors. Bed sensors work with most institutional mattress styles and mattress overlays. Alarm activates when weight is removed from sensor pad, chair belt sensor is unfastened, or PIR sensor detects activity. Nurse Call Interface. 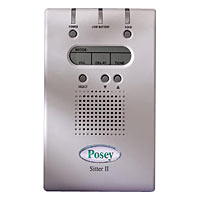 Provides dual alarm notice at patient’s room and nursing station. Provides the ability to mute the alarming function at the patient’s bedside and just alarm at any nurse call system notification points. Failsafe sensor alarm. The Posey Sitter II activates if a sensor cord is removed from the alarm. Battery operated. The alarm utilizes four (4) “C” alkaline batteries. There are no complicated cords or risk of power shortages or shock. Low battery warning. Low battery light blinks when batteries need changing. NEVER connect other manufacturers’ sensors to a Posey alarm. 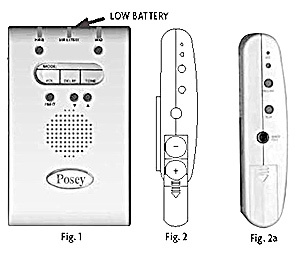 Use of another manufacturers’ sensors may damage the Posey alarm, cause the fall monitoring system not to function as intended, and will void the factory warranty. The battery-operated Sitter II is portable and long lasting. Fresh alkaline batteries have an estimated life of 30 days of daily use. Actual life depends on alarm mode,ntone, and volume you select. The low battery light will flash red when new batteries are needed (fig. 1). Change batteries at once. 1. Press down on arrow. Slide battery door down (fig. 2). DO NOT attempt to remove battery door; it does not separate from alarm. 2. Carefully remove batteries to avoid damage to battery door. 3. Insert four (4) new “C” alkaline batteries (fig. 2). Take care not to damage battery contacts. 4. Push down gently on batteries and slide battery door closed until it clicks shut (fig. 2a). Alarm Signal: Sitter II sound system is designed to reproduce frequencies in the range of approximately 300 t0 3000Hz (cycles per second).